There’s a new restaurant in town! 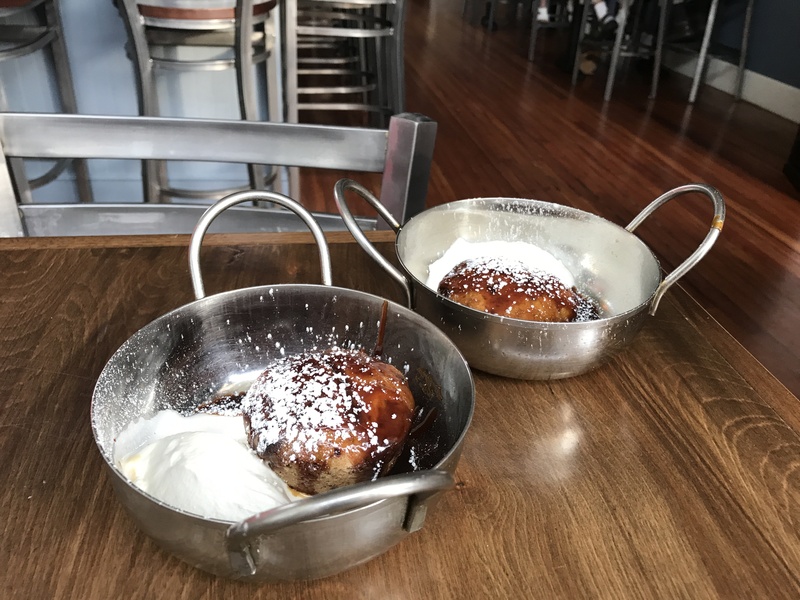 Not long ago, several gals in our neighborhood ventured downtown and treated ourselves to a night on the town at an exciting new restaurant in Exeter. 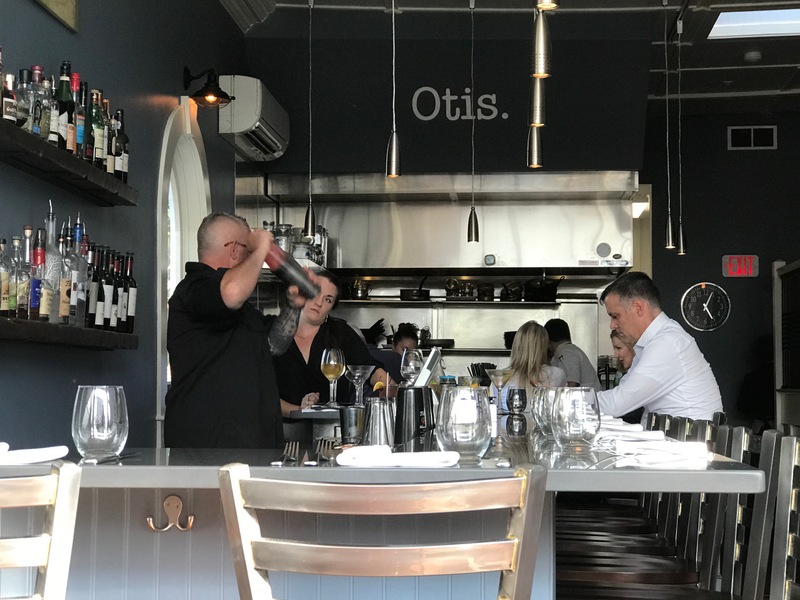 The new restaurant is named Otis. Yes, that’s the name and it comes from the business that was housed in that building long ago, the Otis Sleeper Jewelry Store. We were excited to sample the goods because Otis was just named by New Hampshire Magazine as 2017’s Best of New Hampshire… and right here in our town! A photo of a culinary creation from the restaurant was pictured on the magazine cover. 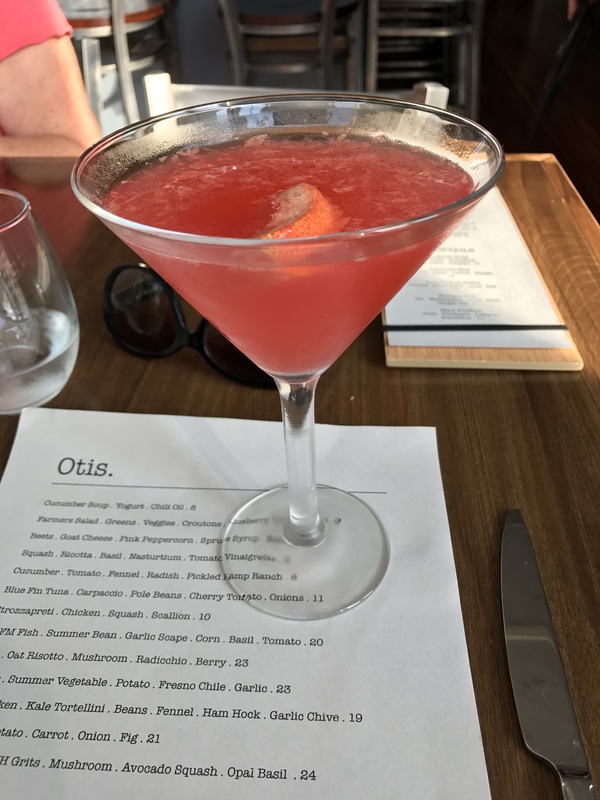 Otis is a bistro style restaurant serving American foods with locally sourced ingredients. New Hampshire magazine calls the space ‘intimate,’ as there are only 28 seats for diners. Smaller tables line a long wall. Options for larger tables are limited due to the building’s size. A group can sit at the chef’s table and watch the food being prepared by the professionals or sit at the window and watch all the town’s activity. The window is where we chose to be. From there we were a stone’s throw from the center of town and the historic bandstand. 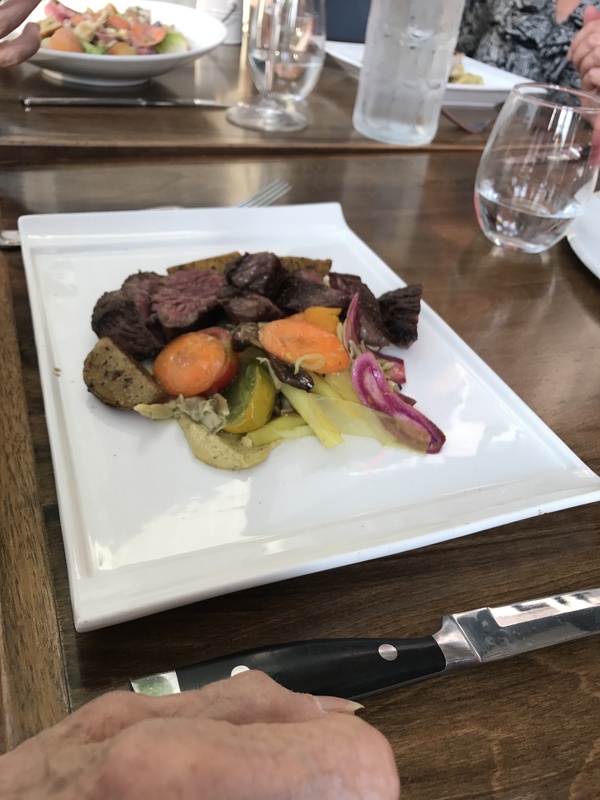 The atmosphere was lively, the service unmatched, and our food was artful and delicious. It’s a popular spot for diners and at capacity this night with happy diners. As the evening progressed, it almost seemed a party was in progress. Lee Frank is both the chef and owner of Otis.Restaurant was well-know to diners as a chef extraordinaire at several popular seacoast restaurants before coming to Exeter to establish his own eatery. What a movie that was! There’s a lot of paper on the roll and I’m sure other wise sayings will ‘roll on’ nightly. …and it makes me feel a little like an outsider in society. I’ve always lived with (hate the word ‘owned’) canines during my lifetime: English Setters, Irish Setters, dachshunds, labs, and several mutts. I’ve lived with and loved cats, too: short-haired, long-haired, Siamese, and several alley cats, all of whom adopted me and not the other way around. My children grew up with canines and felines. But right now, it’s just the two of us and we no longer live with 4-legged residents. We have downsized. Our home is now small and the property is communal. I have a daughter who says she couldn’t live without being surrounded by her dogs and cats as we had when she was young. Her house is full of them as you can see. They follow her from room to room and gaze up trying to anticipate her next move as she completes daily activities. The family loves them with a passion. When we first became dog-less, there was a void. No whines or barks. Bowls and toys and brushes and food went with Annabelle. We were no longer are on a first name basis with the local vet. No more dog license renewals. No more scheduling human activities around the dog’s schedule. It was that empty nest syndrome that I felt when the kids moved out. I found myself looking at too many of those cute puppy videos on Facebook and stopping strangers with dogs on the street to ask about their pets. Of course, the greatest fix of all is when the grands fill the house with noise and activity and make everything all right with the world, but there I am watching those videos again.